…bees, 70% of Worlds crops & diesel…! The Gods method of 70% of Worlds Trees/Crops pollination…! WHAT WAS FIRST ? The Flowers or the Bees…? 70% of Worlds “crops” depend on bees…! ! ! Air pollution is bad for people. It has been linked to asthma, respiratory problems, cardiovascular diseases and even cancer. Now comes word that it may also be harmful to bees. A new study in the journal Scientific Reports finds that exposure to toxic emissions can affect the insect’s ability to recognize the odor of flowers. 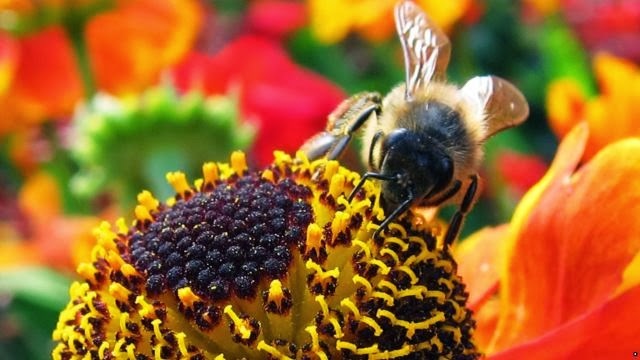 That is a big problem because bees – as they fly from flower to flower – pollinate about 70 percent of the world’s food crops. Researchers at Britain’s University of Southampton focused on honeybees, a managed species taken to pollinate farmers’ fields. Each year, about one-third of their hives are wiped out by a mysterious disease called colony collapse disorder. …well believe it or not according to Science, it must have been “trees” that did not reproduce by flowers and seeds…! SPECIALIZATION CAME AFTERWORDS, and Insects came posteriorly…! SORRY FOLKS…! The funny thing about it all, is that crops did not EVOLVE self pollination methods, other than wind, some other beings or humming birds…! They need the Bees…! Is not that quite significantly weird as to the Economy of Evolution…! And external method of fertilization…! That if non existent, EVOLUTION did not make crops to self POLLINATE…! ! ! MEANING TO SAY IN ONE FORM: The Economy of Evolution went down a “DEPENDANCE LANE/WAY” not very INDEPENDENT or Economical…! YES Diesel does harm to me, and “they” know it…! So imagine what it does to Bees…! ← …the ignorance of Legality of Canadian Tire Stores or Canada and Canadians must be a "mental lapse"…!